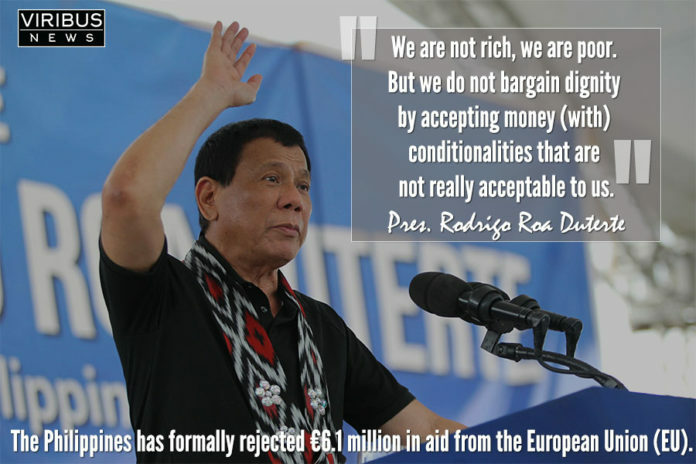 The Philippines have formally rejected €6.1 million in aid from the European Union (EU). It was confirmed by the EU ambassador to the Philippines, Franz Jessen, that the Philippines needed to sign the EU-Philippine Trade Related Technical Assistance (TRTA) by the end of 2017, however it was returned back to the EU without signature. Resulting in a formal rejection of the €6.1 million proposed. This matches part of the ethos of his party for “Self-reliance”. Jessen continued by stating, the Philippines will also reject the €40 million aid for the renewable energy project. Which was going to be used for the construction of the solar power plants in Mindanao. According to him, a Sustainable energy project in Mindanao that would give a big help to the poor people in the region will be put to waste. Jessen added that the EU had respected the decision amicably, and that despite the rejection, the EU would be still willing to continue the project in Mindanao. The Philippines President Rodrigo Duterte has in the past criticised the EU for making a conditions attached to their aid payments, for example the implementation of the human rights regulation, which would have resulted in a lack of ability by the ruling government to tackle the growing terrorist and drugs issues. President Duterte strongly stated that he will never accept any aid payments by the EU because it continues to be critical of his anti-drug campaign, which is the solution conducted by the Philippines Government to tackle drug related crime. This bold statement demonstrates that countries do not want the EU to tell them how to run their own affairs.